I know I say the same thing every month...but how on earth is it the 15th already?!? 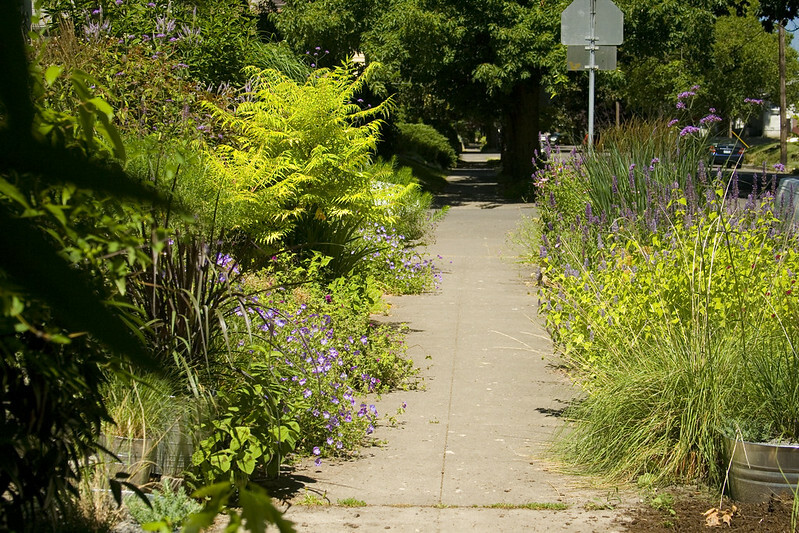 While away in San Francisco earlier this month, everything seemed to surge with new growth. I'll admit, even though I know most of my plants are tough, I still fretted about them not getting watered while we were gone (which happened to coincide with some of the hottest temps of the year here in Portland). I'm happy to report that everything was fine (of course) and growing like crazy! While this weekend was pleasant, it's looking like we're in for some more nasty, hot weather for the rest of the week...ugh. I totally forgot to stake these earlier and now they are flopping like crazy...oh well, they are still pretty...and the bees love them. 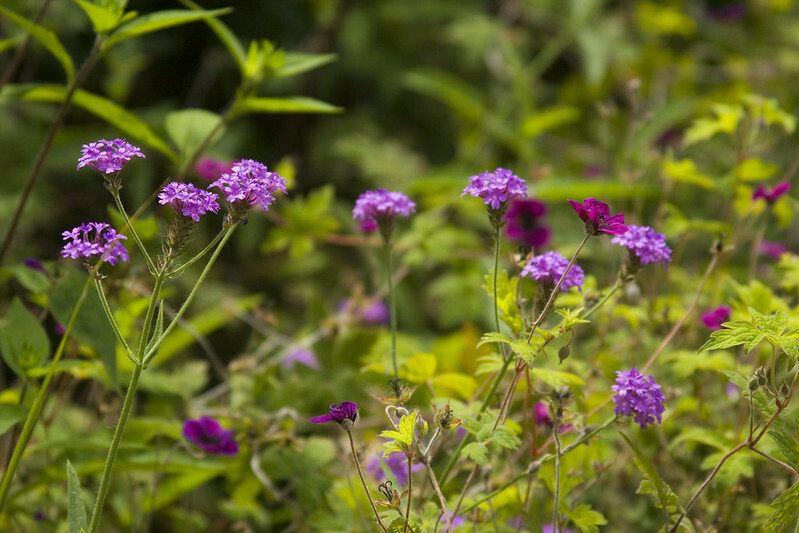 I have several different varieties of Verbena in my garden, this one spread about quite a bit by underground runners...but I just love it's bright color popping up in unexpected spots. The queen of Verbenas, this one reseeds like crazy...and I usually let it stay...I don't think you can really have too much! 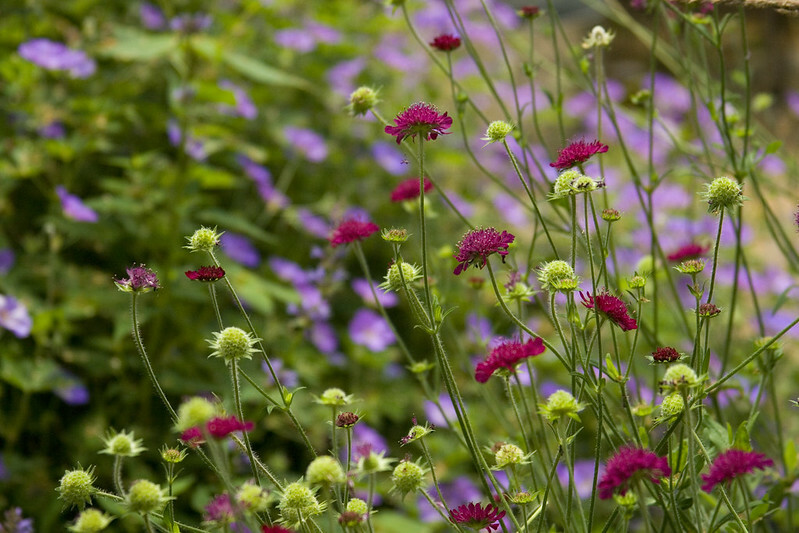 On the left is actually another form of Verbena rigida called 'Polaris', I really like it's cooler coloring...and it's equally as tough (never a drop of water for those two). 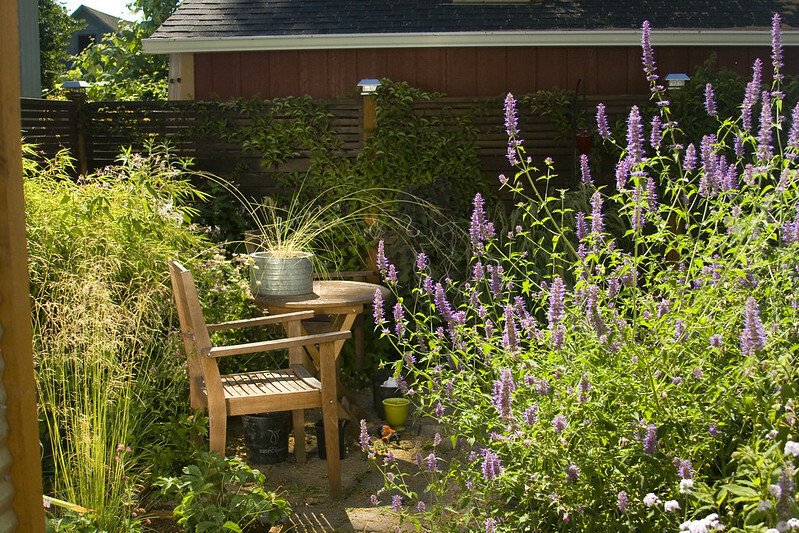 Another drought-tolerant duo on the right, Teucrium hircanicum in the foreground and Agastache 'Liquorice Candy' in the background. The Teucrium actually started blooming about 2-3 weeks early this year...so this patch is starting to finish up blooming already. Another sign of our crazy year...the Sedum 'Matrona' are already blooming...so weird. 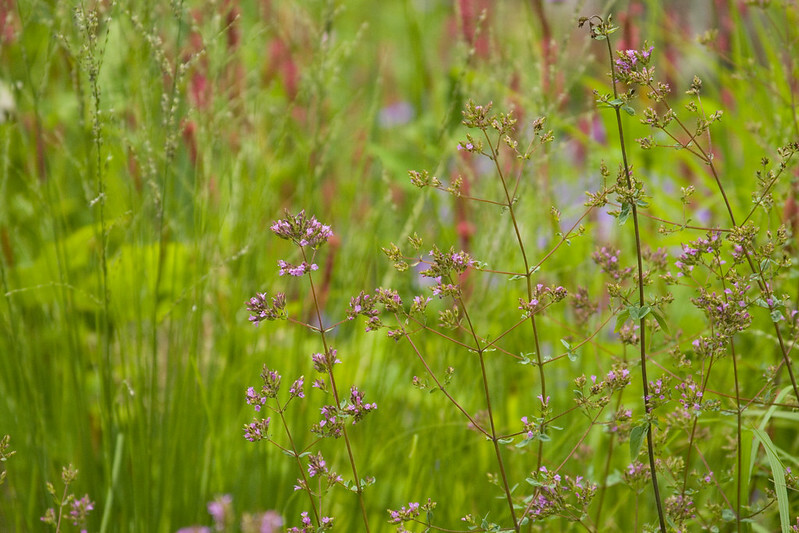 A tiny Sanguisorbia for those of us with smaller gardens, this injects a nice airy hint of color and texture among grasses. It seems like these are also blooming earlier than usual this year as well (I checked, and yes, they are about a month early). I really love this little Persicaria, which is much smaller than it's cousins...it's not as great at dealing with heat and drought, however...it needs fairly consistent water, or the leaves crisp. A much tougher and more vigorous (as in MUCH LARGER) Persicaria, this one took a few years to settle in, but it blooming like crazy this year! It looks so great with grasses and the blue Geranium 'Rozanne' at its feet. I stuck a cutting of Agastache 'Blue Blazes' behind 'Firetail' last year and it has grown huge...the two make quite the pair. Speaking of Agastaches, let's check those out...I have so many these days...including this garden classic. This Agastache was a gift from William McClenathan, owner of local nursery Viscaya...it's gorgeous! The big boy of Agastaches, this thing gets absolutely enormous...especially since I always forget to trim it to control it's size. Oh well...it's so gorgeous...I guess I can live with it swallowing up its neighbors. A wonderful introduction from Terra Nova, this is a smaller Agastache (about 2' tall in bloom), but blooms for months and months...and with great, saturated color. 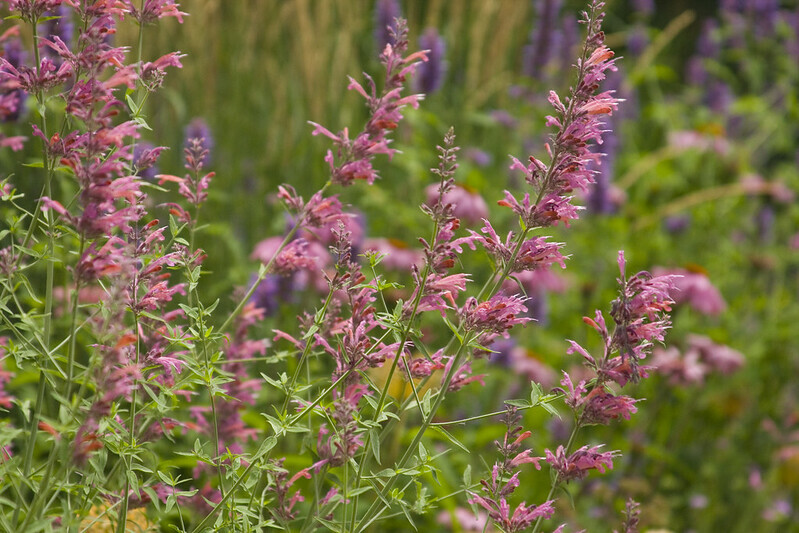 This great hybrid from Agastache rupestris has wonderful, warm coloring. Always exciting, the Echinops are starting to bloom...the bees are hovering nearby in anticipation. While a few of the Astrantias were blooming in spring, there are some that bloom almost all summer as well, including this one. This rose-blushed white Astrantia is the most floriferous one I have...it just goes and goes and goes. It also reseeds like crazy! The only new Astrantia I bought this year (limited space, damn you!) was this dark beauty...so nice! In other people's gardens, this forms a nice clump...in my garden it's more of a weaver. Of course, you can't have summer without Echinaceas...well, at least I can't...and this is MY garden! A new variety I'm trying this year, 'Showoff'. I got it for its deeply-reflexed petals. It's just starting to bloom, so time will tell if this becomes my new standard. 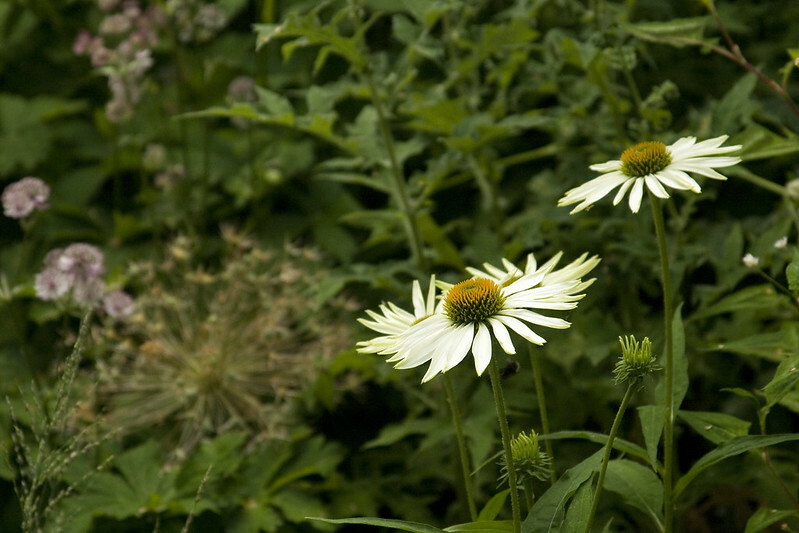 While I admit I don't care for any of the new colors of Echinacea that seem to pop up every year, and prefer something closer to the plant in its natural state, I do like the white varieties as well. Sorry, I just love 'em! While some strange insects ate all the bloom stalk of my poor Eryngium yuccifolium (leaving me with just the boring foliage...meh), the Eryngium venustum were left unscathed. The Knautias are so great, continuously pumping out these rich, berry-red blooms. 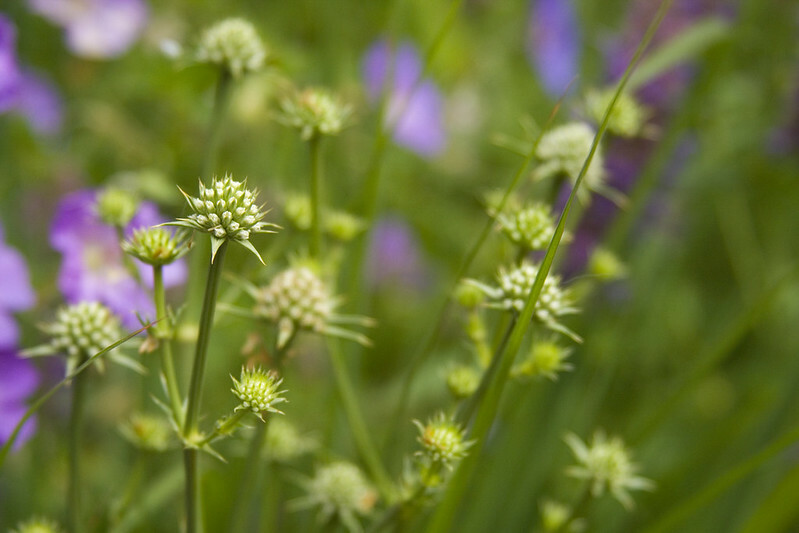 And, of course, what would my garden be without a little bit of 'Rozanne' thrown in? 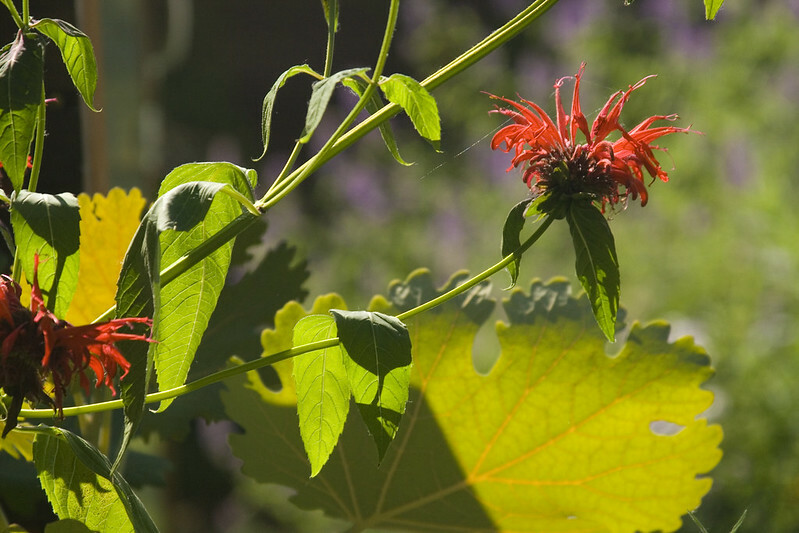 I don't know what possessed me to plant this Monarda in the first place, I'm so not a fan of it's primary-red blooms. But, it's survived about 3 attempts to kill it...and the Hummingbirds adore it...so it gets to stay! You all may remember earlier this year that I was lamenting the fact that my stalwart Monarda 'Raspberry Wine' seemed to have died over the winter. I decided to replace it with 'Purple Rooster' on the right...especially since I actually like it's color more. To my surprise, the moment I planted 'Purple Rooster', I noticed a handful of 'Raspberry Wine' sprouts coming up in the area. It seems the center of the clump died...but the periphery was still alive (although much reduced). I rather like them paired together! A very exciting point in the gardening year, for me, at least, is when the Lilies start blooming! This is the first of my Lilies...and I adore it...sadly, it's not fragrant. After last year, I decided that while this is grandfathered in...only FRAGRANT Lilies need apply to live in my garden in the future! And here we have the newest member of my garden! You may remember I posted about this beauty in my teaser of the Garden Blogger's Fling a while ago. As luck would have it, Heather saw some at Fred Meyer this weekend and grabbed it for me...isn't she the best! I have to admit, I'm a little bit smitten by this plant...I keep moving it around the garden in it's pot...trying to find the perfect spot for it! So, that's pretty much everything blooming at the moment...although I realize as I type this I missed a few things...I'll catch them next month...let's take a look at some wider shots of the garden, shall we? So, I hope this Bloom Day finds you and your garden well and happy! For more gardens around the world, check out Carol's May Dreams Garden...and Happy Bloom Day to you all! When you say that 'Blue Blazes' is big -- how big? 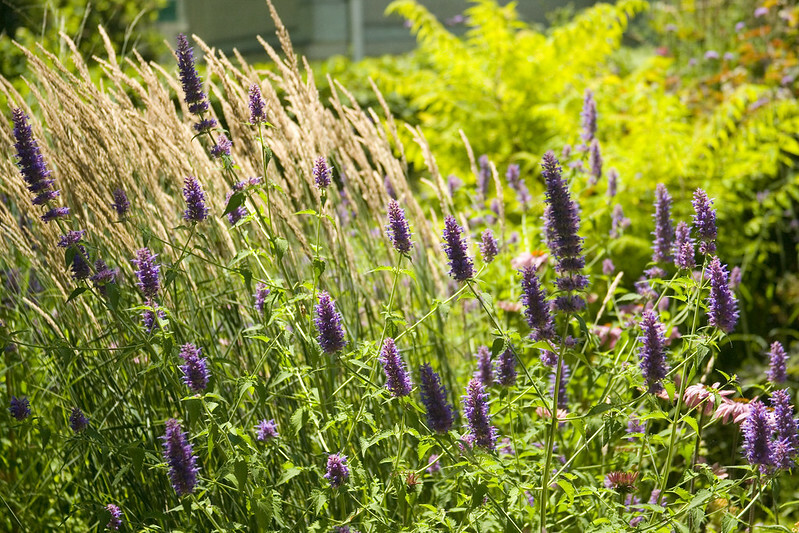 You know I love Agastache and big plants, so combining the two would be great! BIG, Alan, very big! They usually get about 6' tall for me...and probably about as wide, by the end of the summer! I think I mean to send you cuttings this spring, and totally spaced it...remind me next year!!! Gorgeous as usual! I'm looking forward to seeing your garden this coming weekend, when Peter and I come to pick up our plants from the Fling that you so kindly drove home for us. 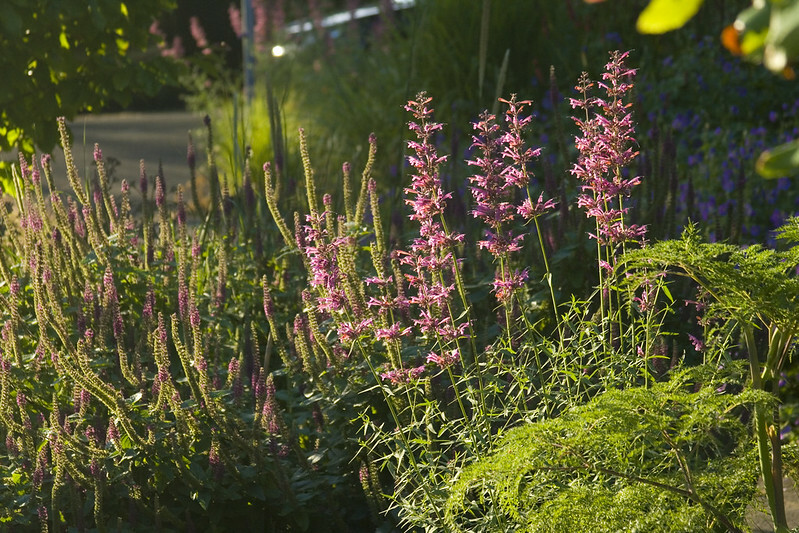 Is that Salvia Amistad the one that was growing in the Sunset Western garden, that was enormous? It's a very pretty bloom. Wow! I just discovered your blog! 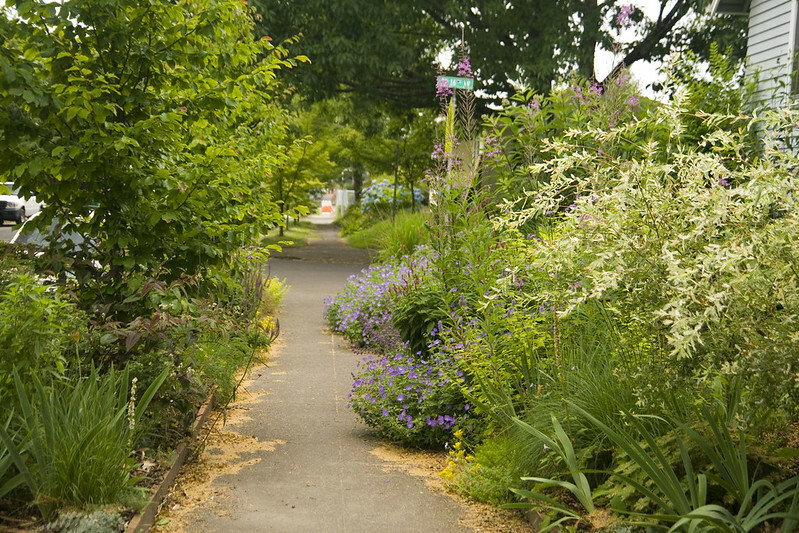 Your garden is amazing - so much beauty I hardly know where to start my gushing. Your photos are marvelous. Thank you for sharing and being so specific about each plant. 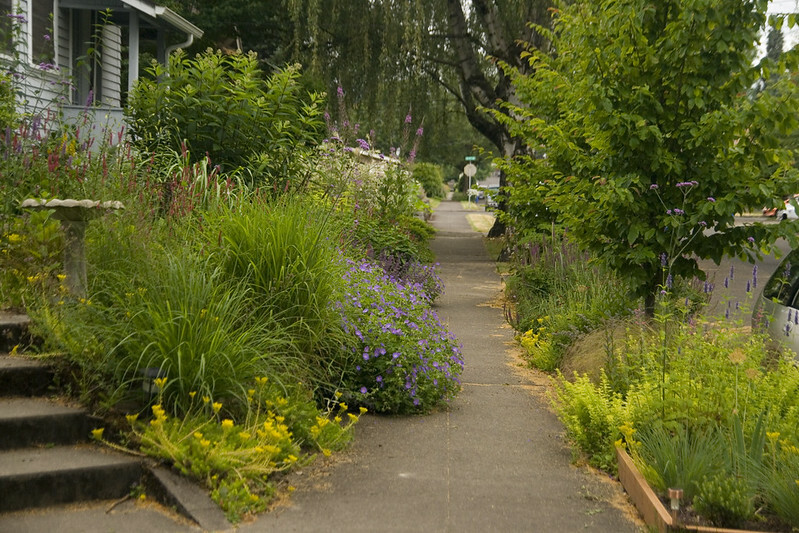 I also loved the garden tour photos. Sounds like a fun group! Thanks, Suzanne, so glad to have you stop by! Beautiful as always! (And your flowers are pretty swell too:) On the really hot days, I feel lucky to live up here and close to the bay where we're usually ten degrees cooler than Portland in the summer. Happy GBBD! Hahaha, aren't you sweet ;-) I'm super-jealous of your cooler temps...maybe someday I'll move further north to take advantage of that! "Glorious" is the word that comes to mind. 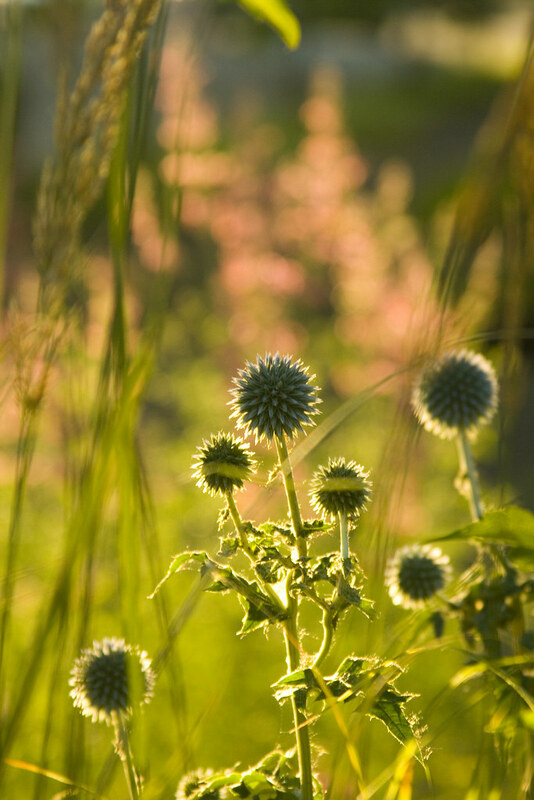 That echinops photo is amazing! Aw, thanks, Heather...do you have any Echinops??? If not, you simply must! 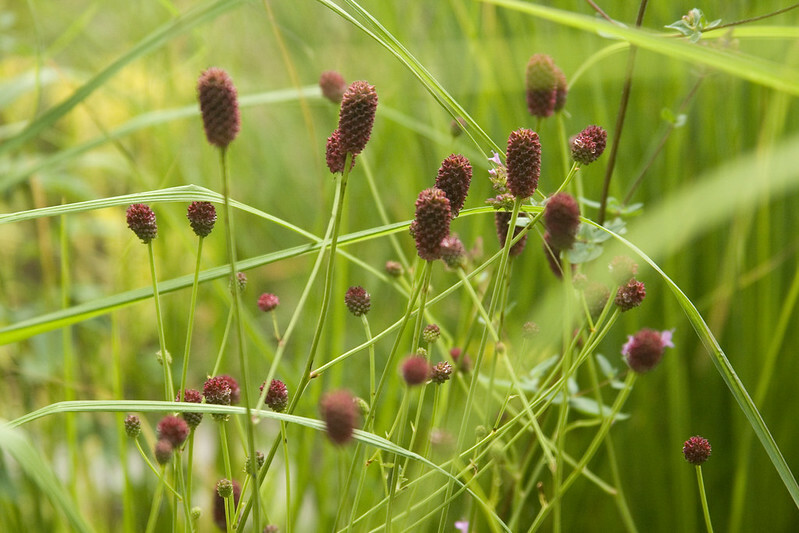 Come July, I think you have the best of it...no grass to turn brown, just borders billowing with beauty. The 'Tall Tails' I got from you are beginning to bloom and I ADORE them. That's great, Ricki...I'm so glad it's happy for you!!! Out of all these riches, it's that pot of grass on the back yard table that I keep scrolling back to. A single grass growing in that beautiful circular pot, on a round table, surrounded by round tubs -- wonderful touch! That's so funny, Denise...I hadn't even really noticed that! You've convinced me. 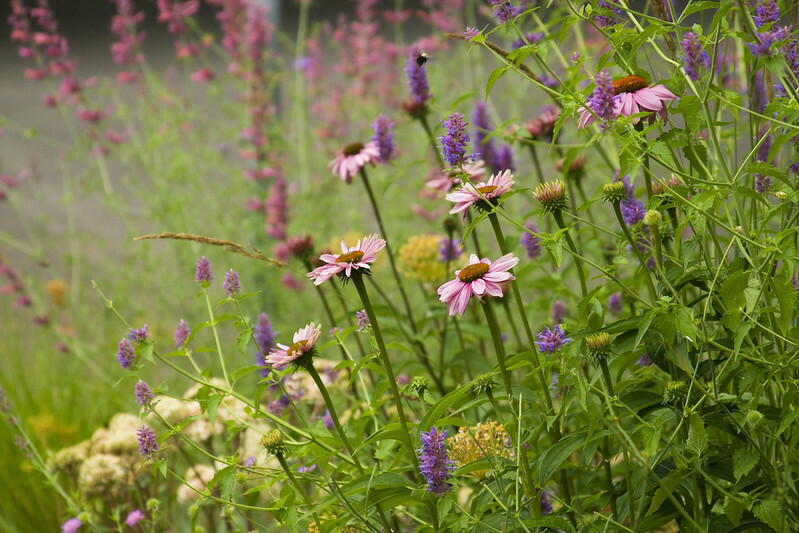 I need more Echinacea - and Agastache, and Verbena, and lilies! Happy GBBD. Thanks for sharing your garden! I've been eagerly awaiting Bloom Day just to see your gorgeous photos of your gorgeous garden and, as always, you did not disappoint! 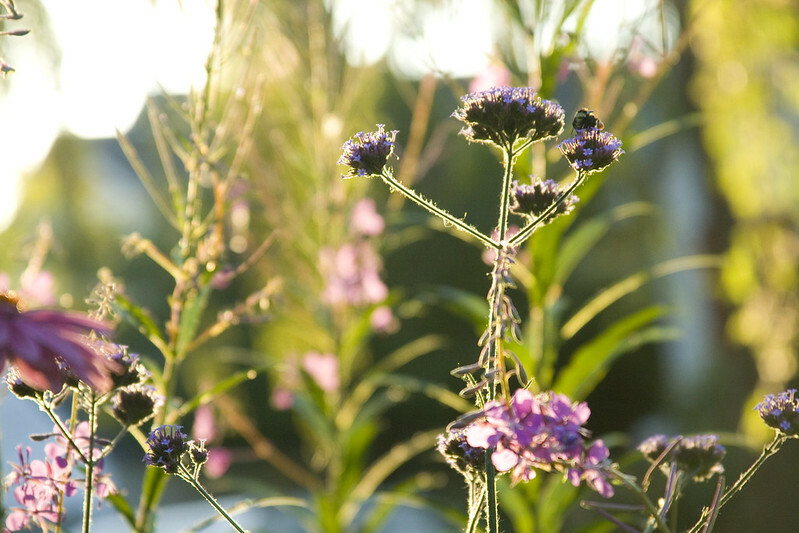 Ha ha, you are right about Verbena bonariensis seeding itself around: Just yesterday, I discovered one in the patch of Rudbeckia triloba I got from you over a year ago! Almost more that the wonderful individual shots, I love the overall pictures of the garden. They illustrate so well your vision and how your garden is coming into its summer fullness! Hahahahaha...that's too funny, Jane! I agree about wide shots...they put it all in perspective...and they are so valuable for us, aren't they! The backyard looks great. I don't think I've seen photos except when it was more recently planted or still in progress. It looks like a great hang out. 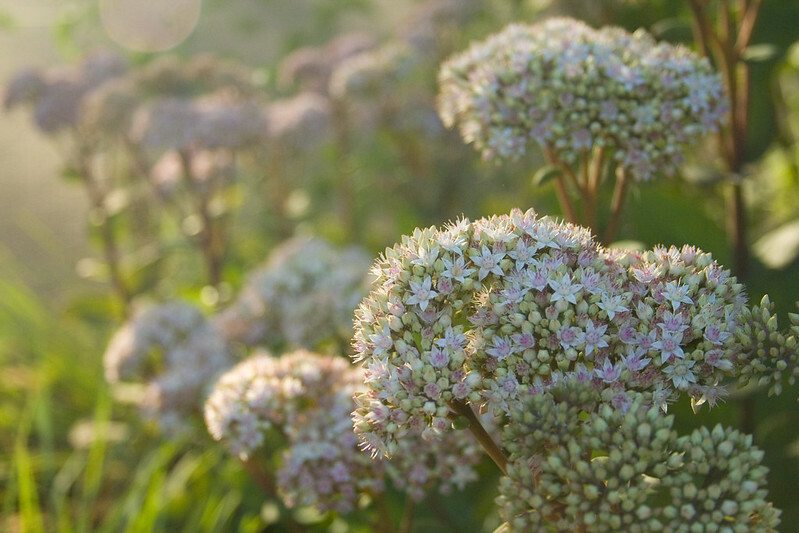 Do you like Sedum 'Matrona' better than 'Autumn Joy' or have you noticed any differences other than the bloom color? It looks good, but I've never grown it. Yes, I do like 'Matrona' better...mostly because of the reddish-purple coloring of the stems/leaves...just extends the season of interest. The blooms of 'Autumn Joy', however, are better, I think...a much richer, more saturated red. Oh, Scott, it looks just spectacular. All that sunshine! Excuse me while I sit here weeping quietly. Don't be sad, Helen! If it makes you feel better, I'm kind of over the sunshine and can't wait for rain again! I love your new Astrantia! Will definitely have to look around for that one... Also love that you always have so many Echinacea, they really don't like me, but I love them! Although this year the Rudbekia have done really well so at least I have something even if I wish they were pink. I'm always tempted to try Agastache after reading your posts, but apparently they're not fully hardy here and I don't want them to die after just one year if we have a hard winter... Perhaps it's worth the risk though. 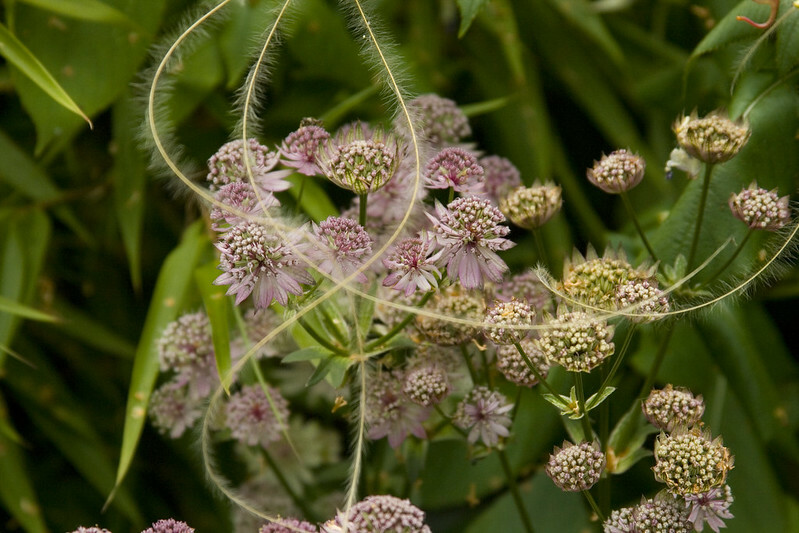 It's a fabulous Astrantia, Gwirrell...and would look so beautiful in your garden! 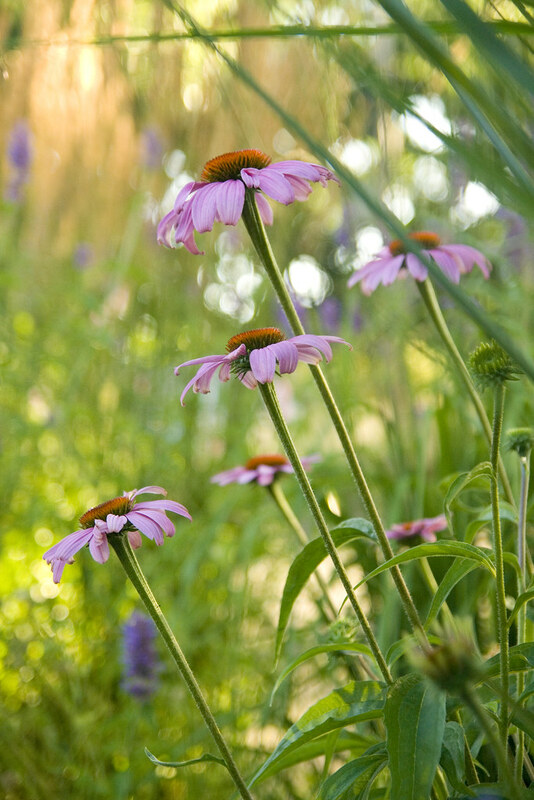 I know what you mean about Echinacea...they can be easy to grow in some places, and damn near impossible in others! Thanks, Spiky...I love that Astrantia! Oh WOW Scott! It has been a while since I dropped by and my how beautiful your beds have filled in. All that work is well worth it when you see all the beautiful results. I adore your Astrantia. Mine died out this mild winter we had and it saddens me after seeing yours. I will have to replace them for certain. 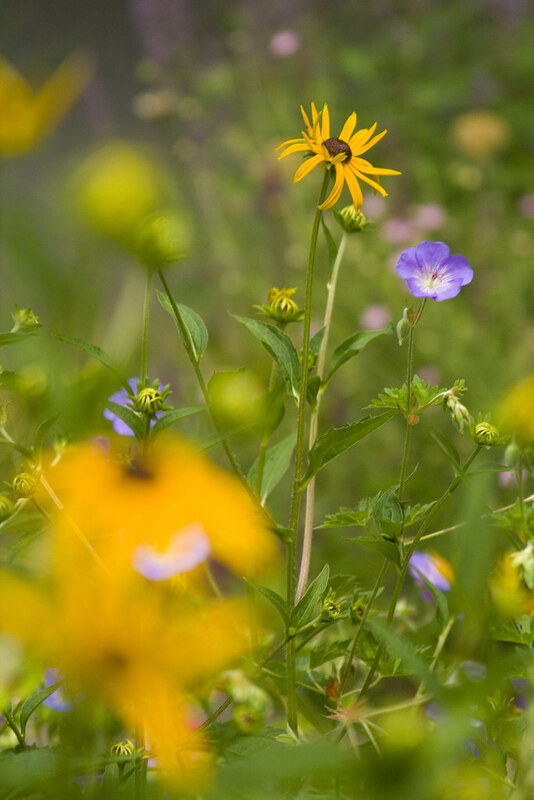 Your beds are a feasting place for all those little pollinators. We have so few bees and even butterflies this year that it is scary. Love it! 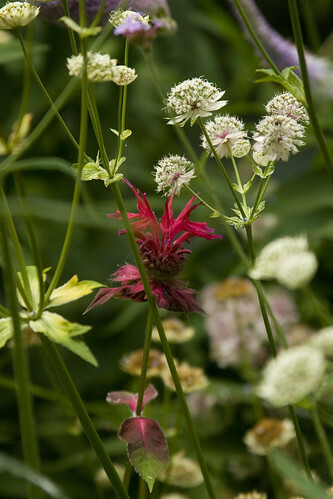 I'm adding astrantia to my plant want list. right. now. Everything looks amazing, Scott! 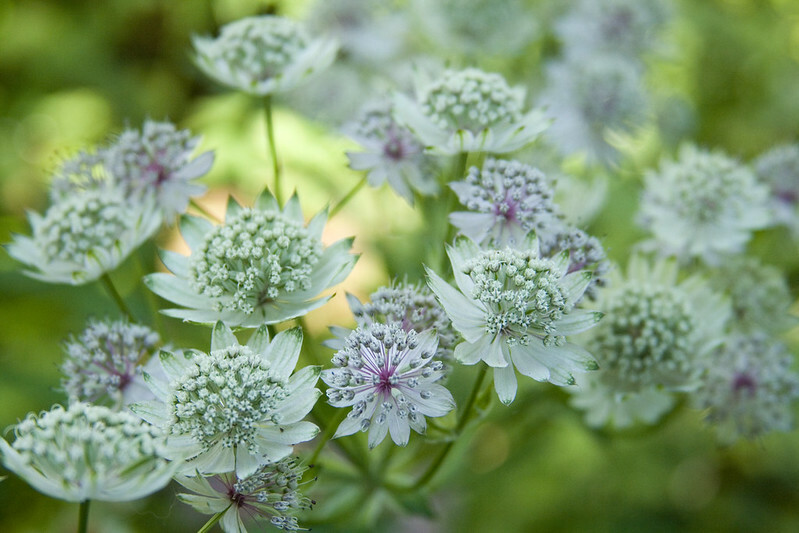 I really love the Astrantia 'Alba' plant. It's a fabulous plant, Zoey...very easy-going! Your garden is so beautiful, just amazing! I love the S. Amistad color and need to find that one. Jealous of your agastache which doesn't like our heat. I think the 'Amistad' will love it there, Shirley...they luxuriate in heat...and they can get BIG! Looks like the garden is creeping. Wait til next year when it leaps! It looks superb.Like the last photo the best. I must put a post together. I can hardly imagine things getting much bigger, Greg...most everything is taller than me already! 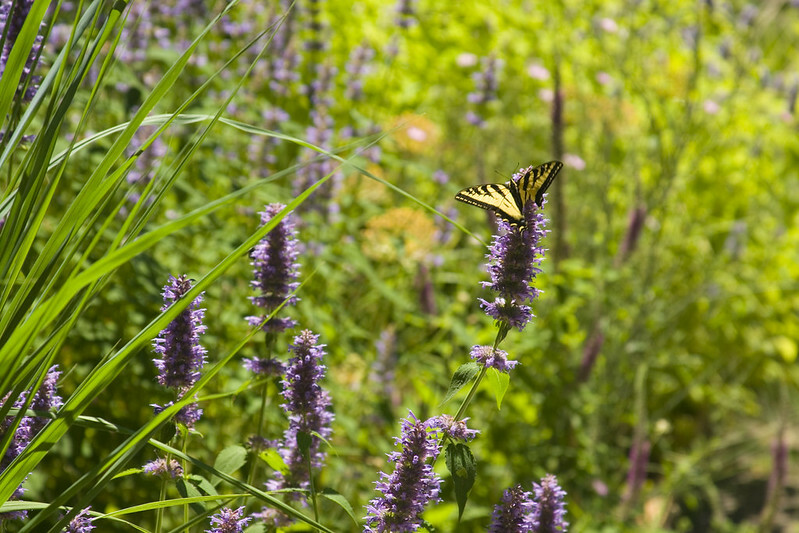 beautiful photography as always - what is that agastache in the backyard? how long has it been there? Thanks, David! It's Agastache 'Blue Blazes', it was just across the path and I moved it to that spot last summer, so it gets more sun...it's only 2 years old...but that particular Agastache is very vigorous...taller than me now! I love the way you have caught the sunlight, especially the back-lighting. It's always hard to get outside at the right moment to get that magical lighting...but so worth it when you can! Your garden is fabulous, as always. 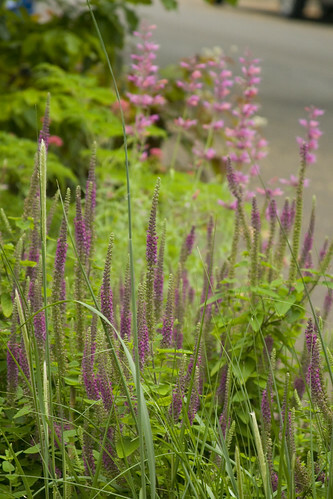 I also have Veronicastrum 'Inspiration', but yours has much straighter flower spikes. 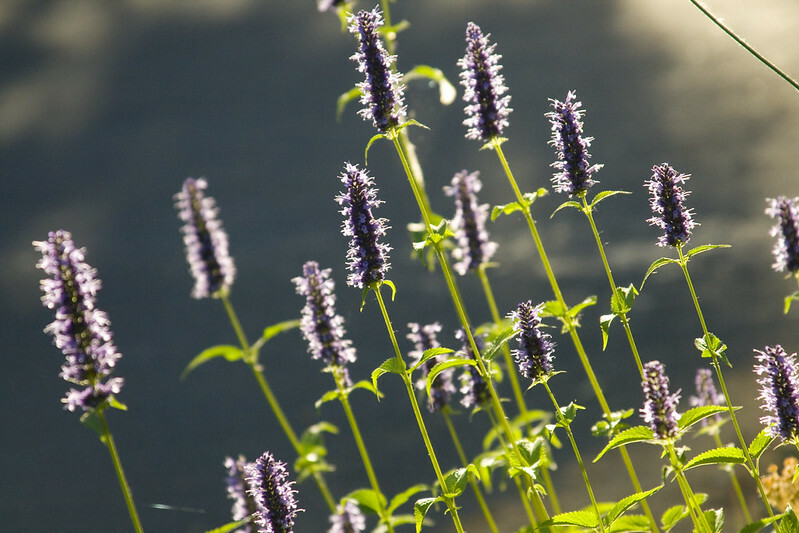 I like the many varieties of Agastache you have. I have lots of Agastache, but all of it is the species foeniculum. So why would you say you like Raspberry Wine but dislike Jacob Kline? I have lots of Raspberry Wine this year, I pair it with Wild Bergamot. I also planted some Purple Rooster this spring but it is not blooming this year. Thanks, Jason! I think I just don't like that bright "primary" red of 'Jacob Cline'...it's a little too strong for me (although, obviously, 'Raspberry Wine' is not shrinking violet)! 'Purple Rooster' is definitely not as vigorous as 'Raspberry Wine' it seems...but that color is pretty amazing! Scott, your backlit photos blow me away every time! That Echinops and the Black Adder shots are amazing! I also love how many purple flowers you have - beautiful! And I think you just inspired me to make full use of my hell strip. For some dumbass reason, I kept some spaces open in case people need park their cars there. But really, since nobody ever seems to bring passengers - who am I trying to please! So watch out - here's to more plants! Gorgeous photos again :) I just pinned several for future inspiration, in particular I love the knautia, astrantia and echinacea pics. It's the middle of winter here so it's perfect timing for me to be planning my summer garden! Glad I could give you a balm for winter blues, Ruth! Thanks for the tour around your garden. I really like the abundance of the flowers. Your garden provides me with a lot of ideas for next years garden. Hi Scott, your planting is right at home with one of those beautiful show gardens that can be seen on flower shows here. Lovely selection as always! The whole scene is such a lovely photo with all the wonderful color that is in your gardens. It all looks fantastic, and I like that you finished with long shots so we can see not only the beauty of each plant but then how it all fits together. 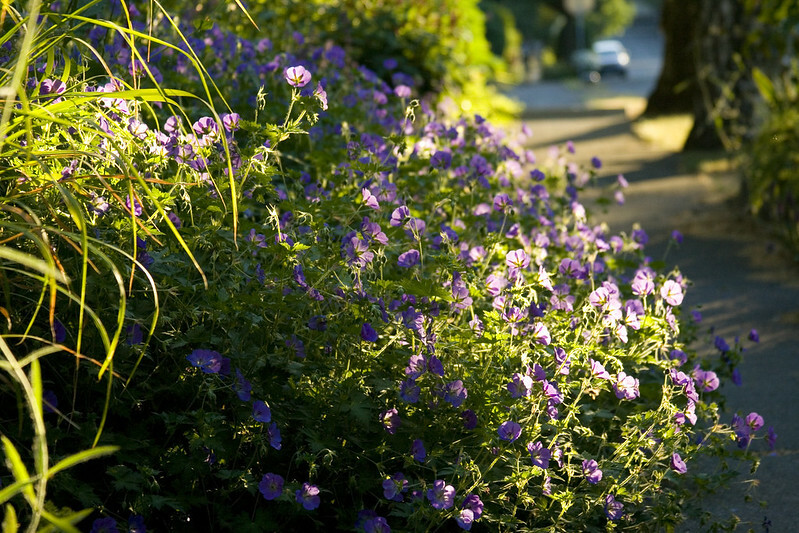 What a retreat you have created on your corner -- and how beautifully you capture it in photos. 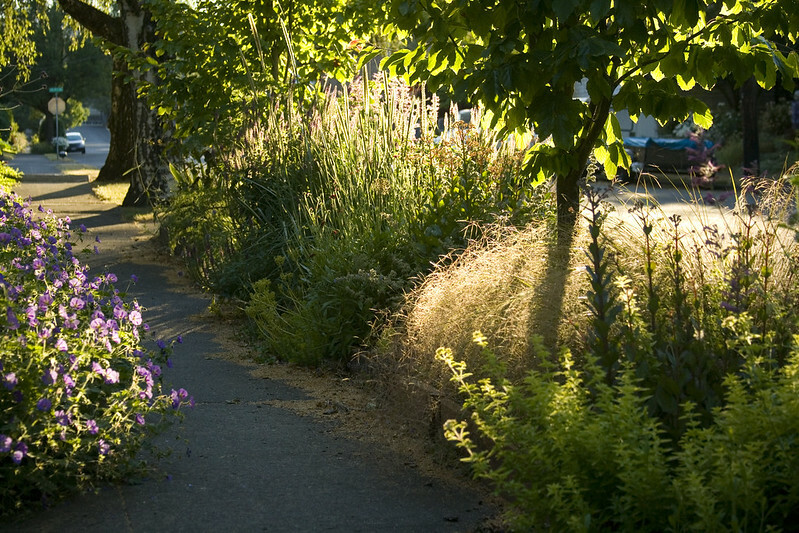 Makes me feel like I am in your garden, enjoying not only the plants and blooms, but the enchanting light as well! You have a gift of being able to capture everything in the most perfect light. The wide angle shots bring all the pieces together. Wow! I can't imagine your garden looking better. You have the perfect garden. I know no gardener ever believes that, but it is true. Hahaha, you make me want to believe it, that's for sure, David! Just gorgeous as always Scott. I love you Sedum 'Matrona' and yes...though the season started off slow many plants are ahead of schedule. Your gardens put a smile on my face! Thanks, Lee...it's amazing how things all seem to catch up at some point, no matter what the winter/spring was like, isn't it? Ha! I wrote just today about not liking my Monarda 'Jacob Cline!' But, as you said, it defies attempts to get rid of it, and the hummingbirds, butterflies, and dragonflies love it! I just need to find an out of the way place for it, where it can have its own way! Haha, it's so true, Kimberley...I've just finally decided to make the best of it...and, as you say, it's hard to deny the pollinators something they obviously love so much! So many, many gorgeous combinations! 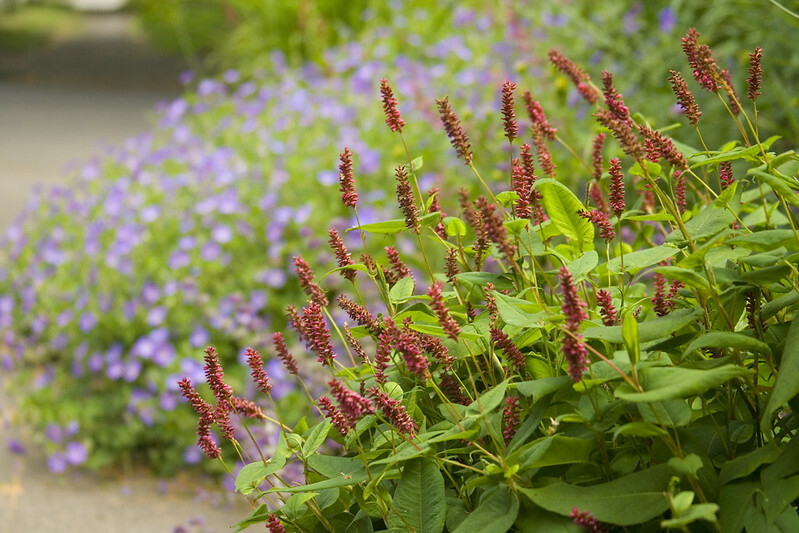 I really love that agastache/persicaria. I'll have to find a spot to include that in the gardens here. And not only beautiful flowers, gorgeous, gorgeous photos. Love your use of light in your superb photographs! Thanks, Deanne! 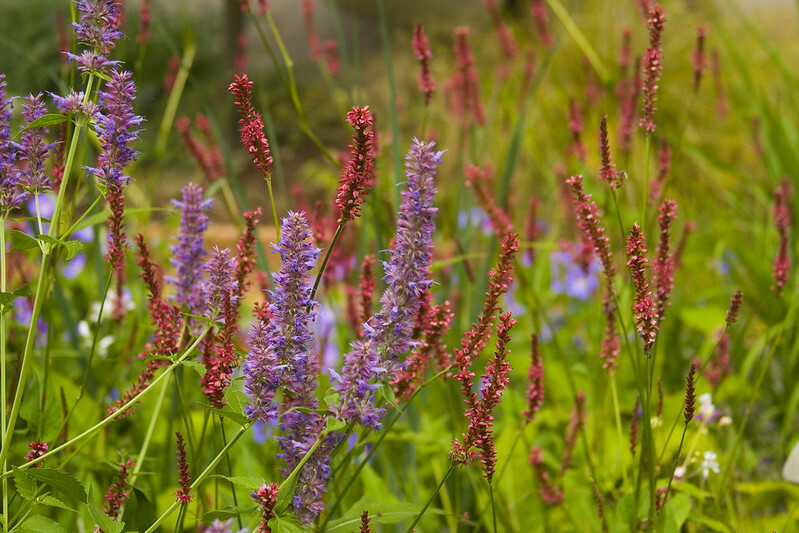 You should totally get those Agastache and Persicaria...they would look divine in your garden! Just splendid Scott..beautiful images of a beautiful garden. I am always so jealous of all your beautiful agastaches, Scott, but I also love the new salvia, the burgundy astrantia, the persicaria...let's face it, I love it all! 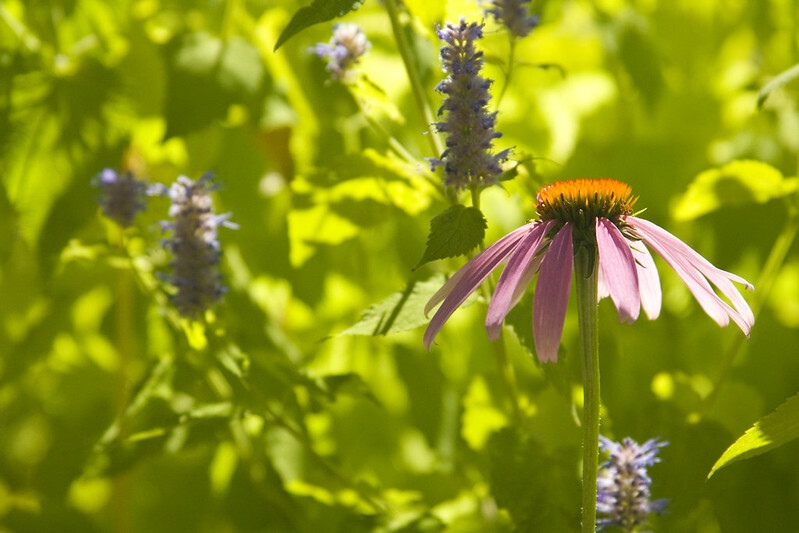 I, too, must have coneflowers; the photo of the coneflowers with the agastache is absolutely beautiful! 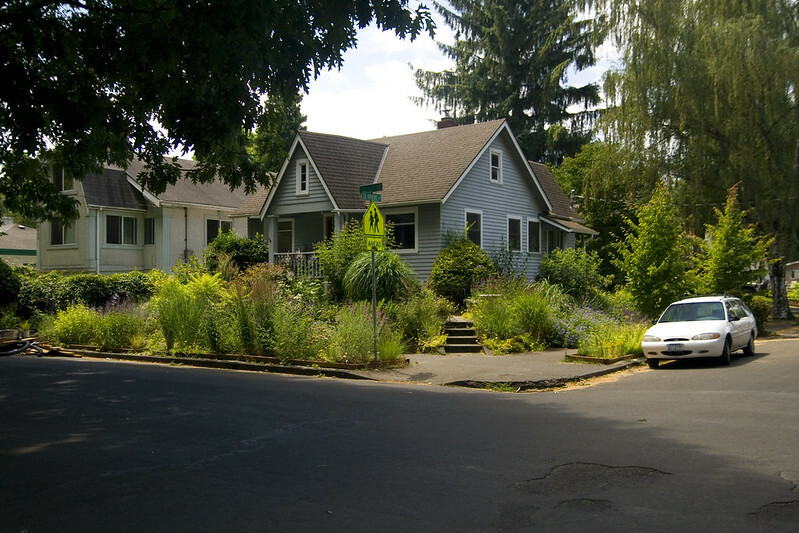 I'm hoping to attend next year's Fling in Portland--I hope your lovely garden will be on the list of attractions. Your garden looks fantastic! I broke down and bought Rozanne last year, she has really taken over a big area, but is not as poofy as yours yet. 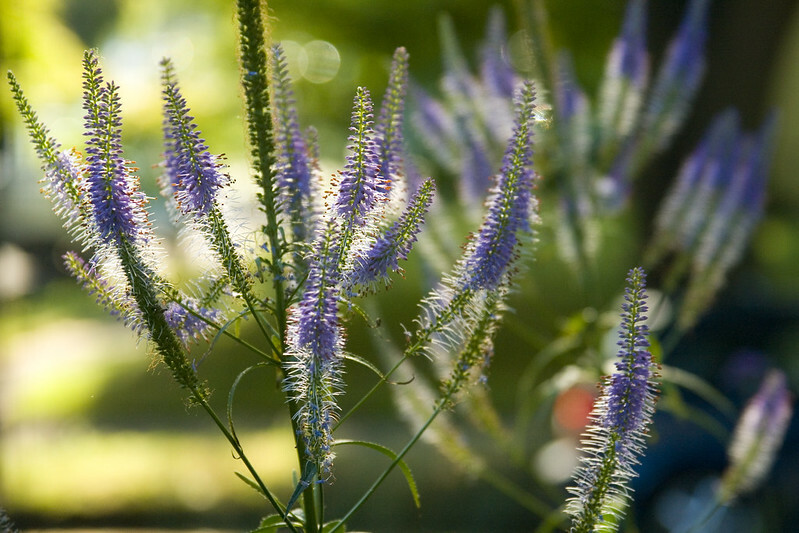 My Veronicastrum also flops terribly. You're wearing me down on the Astrantia's, maybe one of these days... I can't seem to get my Agastaches to repeat very much. 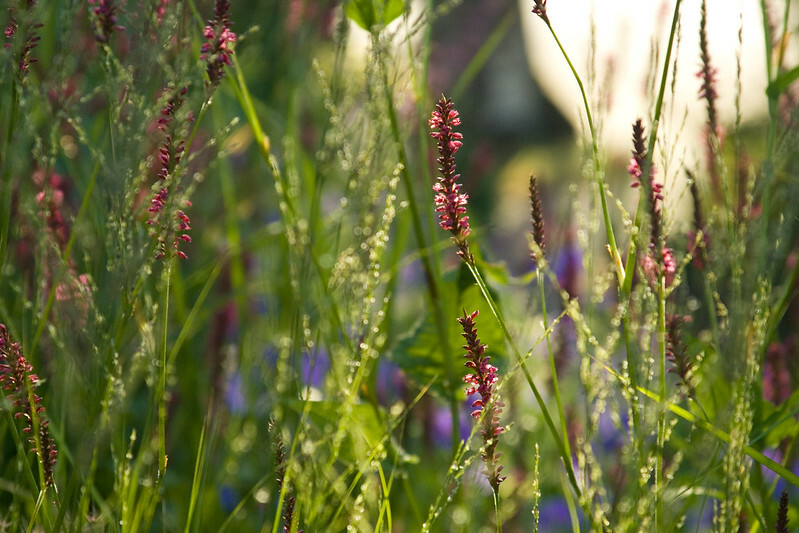 I like all your backlit photos, and imagine you lying on the ground for all the closeups of the flowers. Great shots! Your garden is lovely. It's like having a meadow in the city! I especially like your 'Rozeanne' geranium and the Knautia. Rozeanne grows fine for me, but my knautia is no more! Thanks, Dorothy...that's exactly what I was aiming for :-) So sad about your Knautia :-( I wish you lived closer, I'd give you scads of seedlings! Great photos as always! I also have 'Ann Folkard', bought it last autumn so it is its first summer. Love the flowers but not so sure about the growing habit. 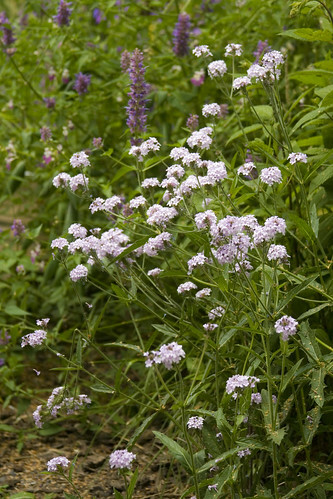 In my garden it is creeping along the ground and entwining with other plants, I thought it would be more upright so I could see the flowers better. Maybe it will get taller next year when more mature. Loved all your different Agastaches, I haven’t got any but I think they could do well in my garden. I have also got rid of all my non-fragrant lilies the last few years, apart from 8 Asiatic very dark red ones which I kept just because I love the colour. 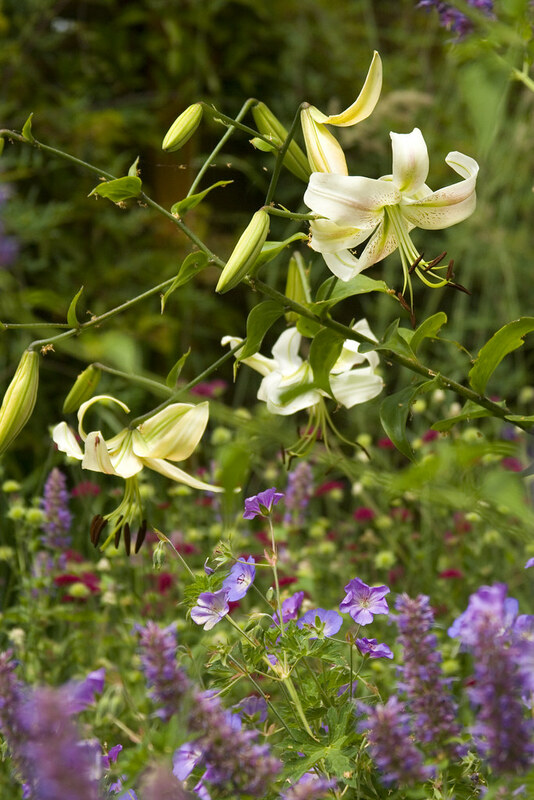 I have around 150 lilies, all the other are fragrant and my garden smell heavenly – even the neighbours can smell them. Thanks for the stroll around your front and back garden, always a treat to come and visit, happy GBBD! OMG...your garden must smell AMAZING, Helene!!! 'Ann Folkard' is a tricky one...she's fairly low-growing, but will sort of scramble up into taller plants...she's kind of persnickety. I love your garden. It's just very summery and natural and beautiful. Congratulations. I hope you can find it, Keity, it's a fabulous plant, and fairly easy to grow...and if it's happy, it'll seed around and you'll have more and more each year! Speechless! Such beautiful combinations. How do you keep them all thriving? I find that some of my plants tend to bully out the others and I've lost a few. I have a few crowded out right now but it is too hot to do any moving around. I hate waiting. Is that a gold sambucus in your border or a tiger eye sumac? I just introduced a gold sambucus to my garden - I really hope it grows up. It's totally a balancing act to keep things in order, for sure! I'm constantly moving and re-arranging things as they grow (or die)! It's actually Rhus 'Tiger Eyes'...it's beautiful!!! Everything is gorgeous! You and Liz keep inspiring me to work on becoming a better photographer . . . except it's hard to find the time. I baked homemade wheat bread today, though. If only I didn't need to sleep then I could accomplish everything on the list. Thanks for mentioning the Star of Beauty blooms all summer - I'd like more of the longer blooming ones and saw that one at my local nursery. Will have to stop in and pick it up. Good luck in the heat. Photography is definitely something that takes lots of practice, isn't it...I'm constantly working to get better at it as well. You've got me beat on the baking front, I'm afraid...I'm dreadful at baking :-( I hope you can get ahold of Star of Beauty...it's a stunner!!! 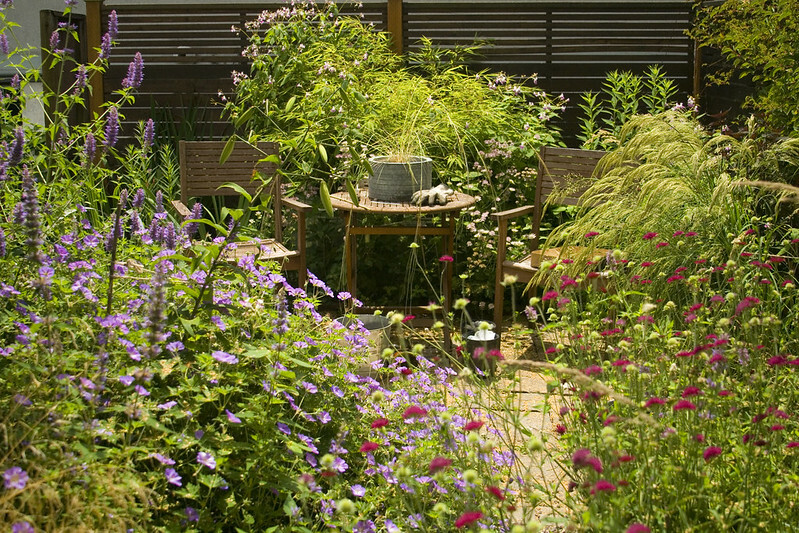 How do you squeeze so much variety into your garden and yet keep it cohesive? It looks really great. Hahahaha...I'm glad it looks cohesive...sometimes I have to wonder, Michael! Scott -- what a spectacularly lush haven you've created! I'm stuck in hot and humid Virginia (have been for 20 years now), but I grew up in Vancouver, WA and went to the UW for undergrad. I MISS THE NORTHWEST! Your garden makes me homesick. 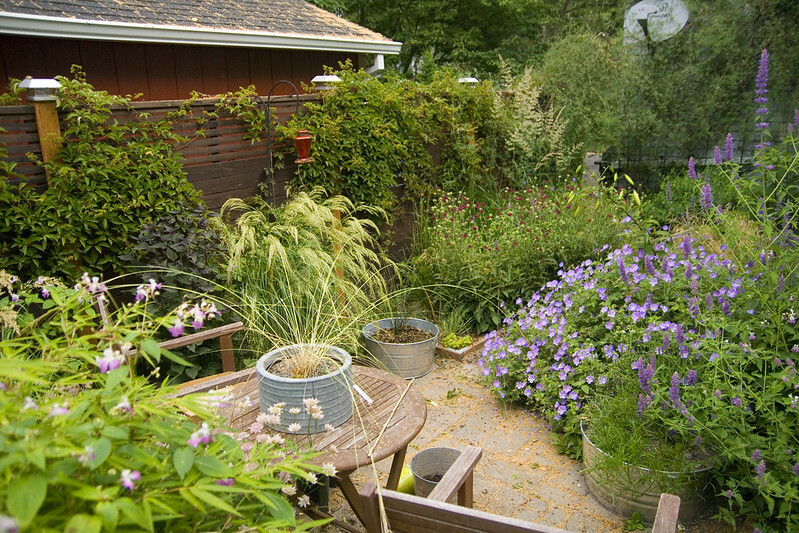 I think I'll pick a handful of the plants you've included here and find spots for them in my own garden. Next best thing to being there. Great post. Wonderful references to flowers I need to add. 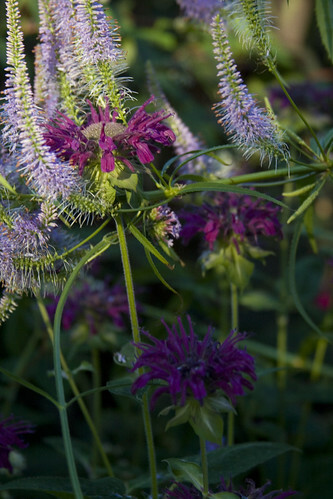 I kept thinking as I read 'oh, this one is really the best' and then I would see something even prettier, from Agastache to Astrantia to Monardas — you've got some beauties. Thanks, John...I know that feeling...plant overload! I am very late at getting to the bloom day posts this month and I am so glad I didn't miss yours Scott. So much inspiration there - I've lost count the amount of times I've scrolled up and down in awe of your planting schemes. I doubt I could choose a favourite - they are all a credit to the hard work you put in! Your gardens stunning and your plant selections are just amazing. I enjoying seeing the big picture as well so we can see how it all works together. 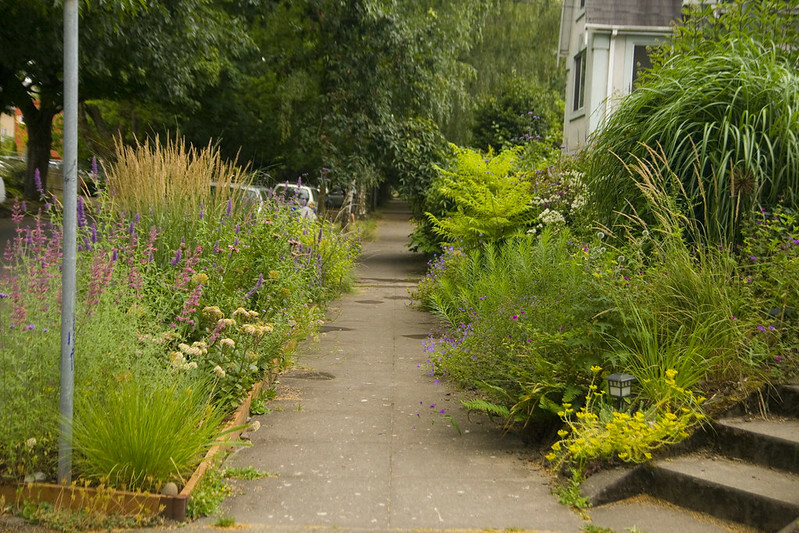 I love the views you share of your gardens and how they soften and naturalize your street corner. 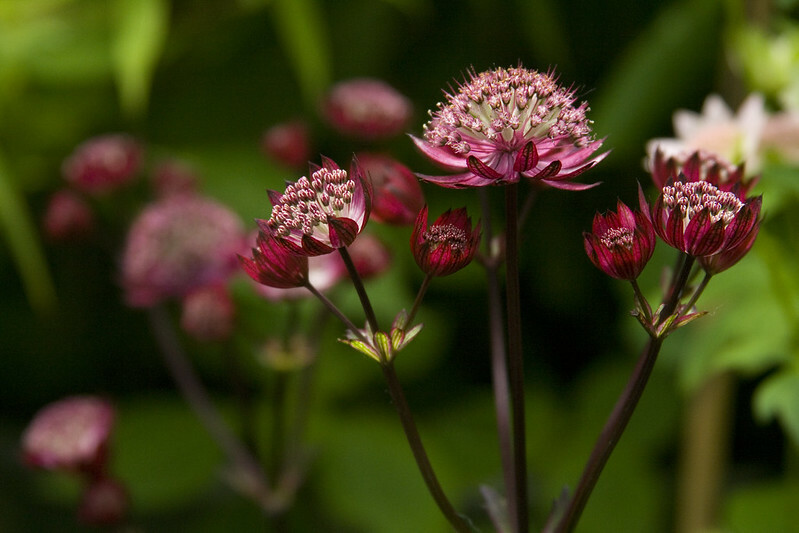 Plus, that Astrantia is fantastic! Fred Meyer? Seriously? The Fred Meyers in Corvallis and Albany are abysmal as far as plants go. It's very sad. 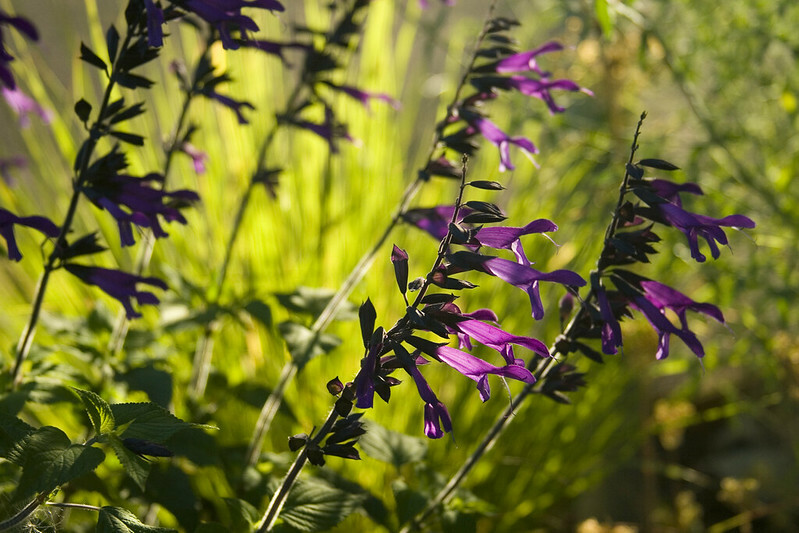 For several years (until a cold spell killed it) I grew 'Purple Majesty' Salvia. I loved it! Everyone raves about 'Black and Blue' but I prefered 'PM.' Fortunately there's 'Wendy's Wish' now. 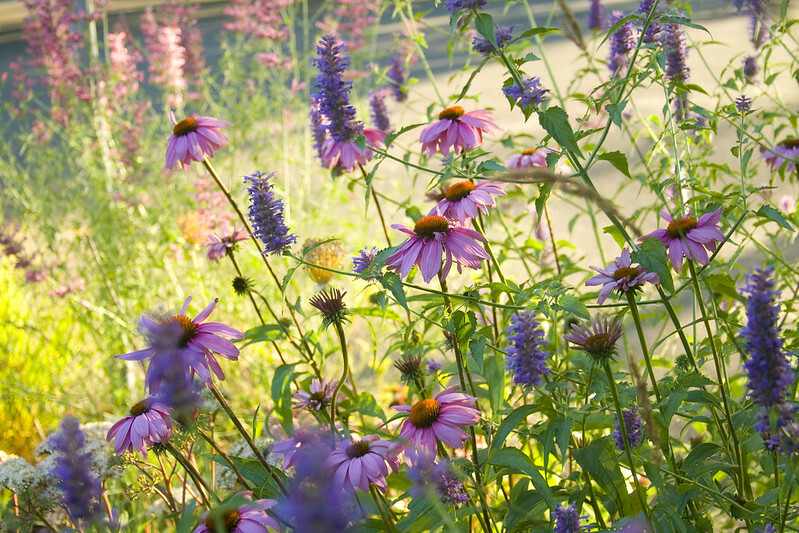 I bet the bees, butterflies and hummers make quite a commotion in your neck of the woods. Just beautiful Scott. I know, Grace, I was so surprised it was at Fred Meyer! I had Purple Majesty for a while, but it really didn't like me and never returned...which made me so sad, because it was stunning! I'll have to keep an eye out for 'Wendy's Wish'! I know, it's such a bummer, Riz. Of course, it's always listed as "lightly scented", but I'm not sure who has a nose with such super-human powers that they can smell anything! Know I am a month off on the posts but wanted to comment. I put in a bunch of Agastache this year and with all the rain we have had they are (for the most part) soggying out...opposite of drying up. Hoping the roots are still viable, just trimmed them off at soil level. You must have superb drainage to have so many.